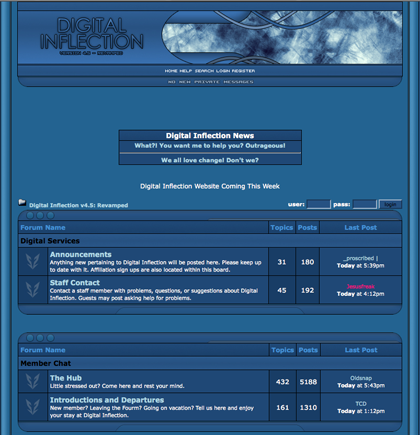 Digital Inflection started out as a forum on Proboards and quickly grew to one of the largest, most active forums hosted by the free forum-software company. 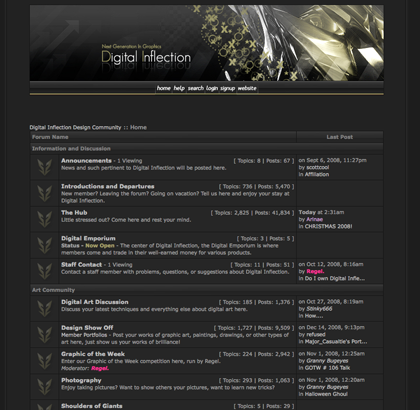 The forums had several million visitors throughout its life time and was voted best ProBoard out of millions of created forums. 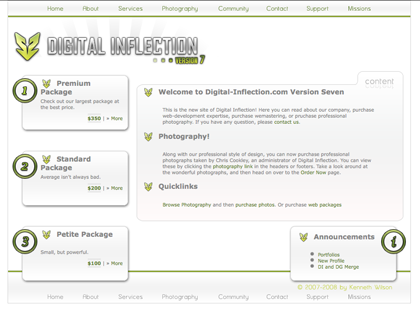 Digital Inflection was a design community that reached out and helped the ProBoard community by teaching basic graphic design techniques through video tutorials, providing thousands of free downloadable graphics, and providing free graphic design services to registered members. Since its closing in 2008, Digital Inflection has morphed from a design community into a web development firm located in Lafayette, Indiana servicing local businesses and the Purdue community.